ISOBOLIC™ represents over a decade of research in protein delivery technology and it truly is the most advanced protein powder Nutrabolics has ever formulated! Using the highest-quality protein legally available, Nutrabolics researchers created a quattro-stage protein delivery system that is designed to nourish your muscles for over 8 hours! This "sustained-release" delivery technology keeps you in an anabolic state which is essential to building strength and muscle density. Each 1 scoop serving is ultra low in carbs and fats and delivers a hefty 25 grams of premium protein using 3 distinct isolate protein sources. These isolates are: Cross-Flow Micro-Filtered Whey Protein Isolate, Micellar Casein derived from Milk Isolate, and Egg Protein Isolate. Each of these powerful protein sources is released into your body at a different speed, allowing you to avoid slipping into a catabolic state and losing muscle. Whey is the 'fastest'protein that spikes amino acid levels before dropping (after 3-4 hours), and micellar casein is the 'slowest'of the three protein sources that raises amino acid levels more gradually but remain stable for an extended period (7-8 hours). Egg protein isolate on the other hand are considered a 'medium' speed protein and release its amino acids between 5-7 hours after consumption. By combining all three protein isolates, you get continuous elevation in protein synthesis for over 8 hours, and the perfect amino acid sequence needed to help support astonishing muscle growth and power gains! Q. Why is protein so important for bodybuilding? A. Every muscle fiber in your body is made of protein so it's more than just "important"–it's absolutely critical to building muscle! Protein is what your body uses to make muscle tissue and without a surplus of available protein, you simply will not grow no matter how hard you train. Bodybuilders need roughly 1 gram of protein per pound of bodyweight. That means a typical 220 pound bodybuilder should take in 220 grams of protein every single day! Getting this from food can be tough to do when you're on a busy schedule –not to mention, it's expensive! This is where protein powder can be a bodybuilder's secret weapon. When it comes to effective protein powders, ISOBOLIC™ is an industry leader. Q. What makes ISOBOLIC™better than other protein powders? A. Nutrabolics is the only company in the world that utilizes Sustained Release Controlled Dispersion Technology. This technology took 7 years to perfect and it's just one component that sets ISOBOLIC™ apart from any other protein powder in existence. When coupled with the 3 advanced protein isolates found in this formula, you can bet your muscles will receive nourishment for several hours after just 1 serving! Q. I've tried other protein powders in the past but found them hard to stomach. How does ISOBOLIC™compare? A. Protein isolates are used in this formula so you're not going to get the doses of lactose and fats found in cheaper, lower-grade protein powders. It is these two substances that cause much of the stomach discomfort, gas, diarrhea and bloating experienced with cheap protein powders. To help maximize digestibility, we've also enhanced ISOBOLIC™with the natural digestive enzyme bromelain. For decades, bromelain has been well known to aid in digestion and helps enhance the absorption of nutrients. ISOBOLIC™ dissolves easily for easy mixing, so you can get quick meals when you need them most. Q. Who should use ISOBOLIC™? A. ISOBOLIC™has been designed for competitive bodybuilders and other athletes looking to build muscle in the shortest time possible. If you want to experience the highest-quality protein powder modern science has to offer, ISOBOLIC™ is unbeatable. BENEFIT: Helps keep your muscles in an anabolic state for over 8 hours. SUPPORT: In several clinical trials, the specific protein isolates found in ISOBOLIC™have been proven to optimize net nitrogen retention, protein absorption efficiency, and even protein synthesis for over 8 hours! This special protein isolate congeals in the stomach and elicits a timed-release effect on protein synthesis. ISOBOLIC™performs with the gradual nourishment functioning of whole food proteins, delivering a sustained release of amino acids into the bloodstream. BENEFIT: Works to maximize anabolic drive. SUPPORT: The unique proteins found in ISOBOLIC™ are time-released throughout your entire body for over 8 hours after they're consumed! But this revolutionary formula doesn't end there. ISOBOLIC™also contains a specific array of protein fractions isolated by the most sophisticated processing technologies available. This maximizes the growth signaling effects of your workouts. The formula also integrates EFAs, cross-functional fibers, and digestive enzymes that all work to maximize anabolic drive in your body. BENEFIT: Manufactured with cutting-edge technology. 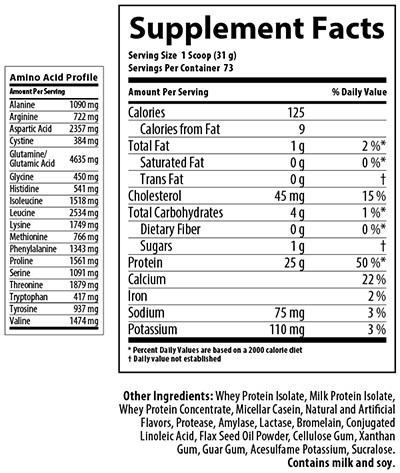 BENEFIT: Contains CLA To support fat loss. 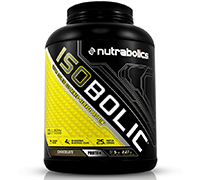 SUPPORT: If you're looking to build muscle while getting leaner, ISOBOLIC™ is a clear choice. Not only will its low-carb formula keep you on track with your protein needs, ISOBOLIC™is also low-carb and infused with CLA to help support fat loss. Research has shown that CLA promotes effective utilization of fats for energy and help reduce catabolism. Mix 1-2 scoops (equaling approx 25-50 grams of protein) with 7 - 14oz of cold water or any beverage of your choice respectively. Use approximately 7 oz of liquid per 1 scoop of powder. Vary the amount of liquid to achieve desired flavor and consistency. Drink 2-6 servings daily, or as needed to satisfy your protein or muscle enhancing requirements.